Almond Flour Bread with Goat Cheese & Pickled Strawberry Preserves – A Healthy Pinch. 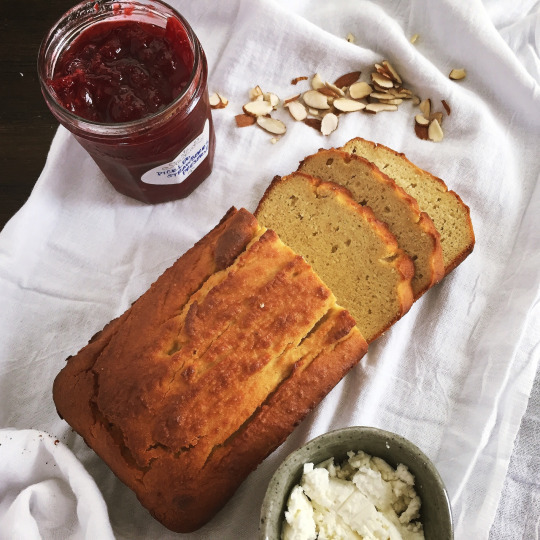 I’m giving you two recipes today- a fabulous gluten-free, grain-free almond flour bread and an unexpected strawberry jam! The almond flour bread is a wonderful option whether or not you follow a gluten-free diet so I’m sure I’ll be making it quite often from here on out. This bread is simple, customizable and completely satisfying. A couple slices are a perfect snack and should keep hunger at bay all the way until lunch. Next, I’m thinking a savory option…some sun-dried tomatoes and herbs, maybe? Be aware, this bread is quite dense and doesn’t taste like your traditional wheat bread. But that’s ok…it’s fun to experiment right? 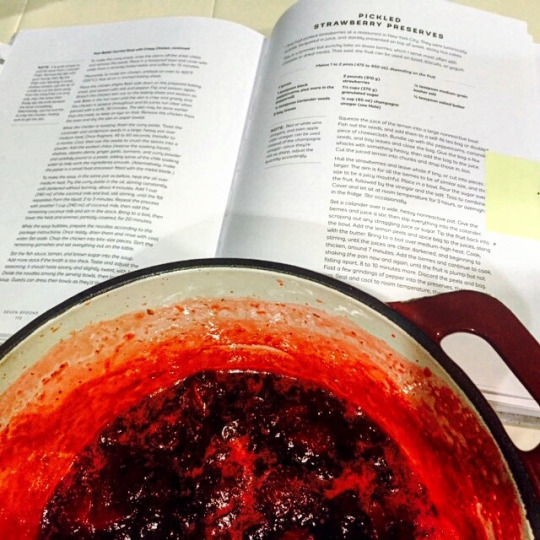 Recently, I have been making quite a few recipes from Tara O’Brady’s Seven Spoons cookbook and her pickled strawberry jam immediately caught my attention. The flavor is superb and with the addition of spices like coriander, bay leaves and black peppercorns, it’s not quite like any jam I’ve tasted before. With strawberry season in full swing, I couldn’t wait to use the ones I had just picked up from the farmers’ market for this recipe. 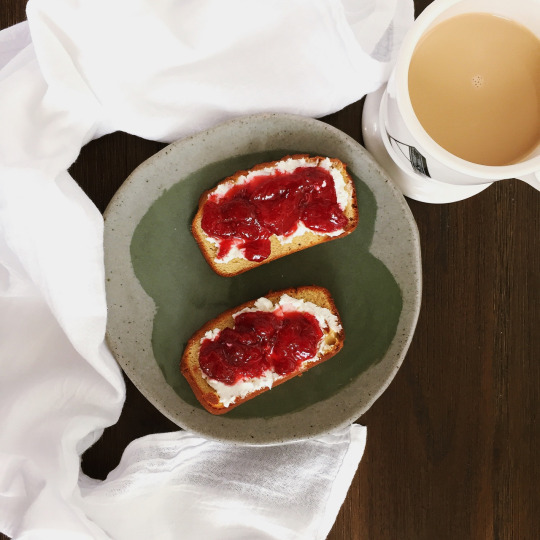 Lightly toast the almond bread then layer the goat cheese and strawberry preserves and…that’s it! And don’t forget the coffee! Though the directions recommend using a food processor, it’s definitely possible to make this bread without one. All you need are two bowls and a wooden spoon. Mix the dry ingredients in one bowl and the wet ingredients in another; add the wet ingredients to the dry and stir to combine (do not over mix). Follow the directions from here. Preheat the oven to 350°F. In a food processor, combine the dry ingredients and pulse them until well combined, about 10 pulses. Add the wet ingredients and mix until well combined, about 20 seconds. Scrape down the edges and add herbs. Pulse another 5 or 6 times to mix the herbs into the dough without puréeing them. The dough will be like a very thick batter but should be thin enough that it wouldn’t roll into a ball. Pour dough into a greased 9×5 bread pan; there will be enough to fill the pan about halfway up. Bake for 30-35 minutes, or until a toothpick comes out clean from the center. Let cool in the pan for 30 minutes before serving. Squeeze the juice of the lemon into a large nonreactive bowl. Fish out the seeds, and add them to a self-fill tea bag or doubled piece of cheesecloth. Bundle up with the peppercorns, coriander, bay leave and close the bag. Give the bag a few whacks with something heavy, then add the bag to the juice. Cut the juiced lemon into chunks and drop those in too. Hull the strawberries and leave whole if tiny, or cut into pieces if larger. The aim is for all the berries to be of similar size. Place in a separate bowl. Pour the sugar over the fruit, followed by the vinegar and salt. Toss to combine. Cover and let sit at room temperature for 3 hours, or overnight in the fridge. Stir occasionally. Set a colander over a wide, heavy nonreactive pot. Give the berries and juice a stir, then slip everything into the colander, scraping out any straggling juice or sugar. Tip the fruit back into the bowl. Add the lemon peels and spice bag to the juices, along with the butter. Bring to a boil over medium-high heat. Cook, stirring, until the juices are clear, darkened, and beginning to thicken, around 7 minutes. Add the berries and continue to cook, shaking the pan now and again, until the fruit is plump but not falling apart, 8 to 10 minutes more. Discard the peels and bag. Fold a few grindings of pepper into the preserves, then pour into jars. Seal and cool to room temperature, then refrigerate up to 1 month.